Board meeting highlights Archives - Hamilton School District. 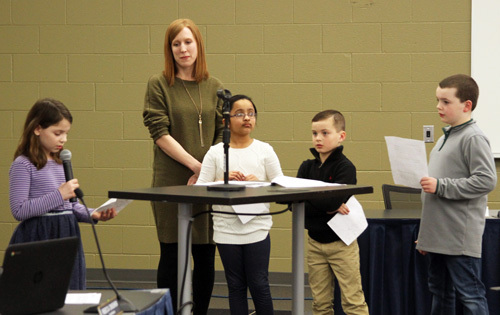 Seven Woodside Elementary School students read tributes written about the school’s paraprofessionals at the April 2 Hamilton School Board meeting. Principal James Edmond, Jr., Ph.D., said the school would not be as successful without the contributions of the paraprofessional group who come to school with great attitudes and build strong relationships with children and families. 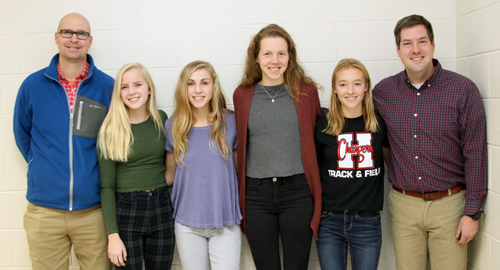 Nine high school students requested admission to the Early College Credit Program (ECCP) that will allow them to take classes next semester at the University of Wisconsin-Waukesha and Milwaukee, Wisconsin Lutheran College, Marquette University and Carroll University. In addition, 17 students’ requests to take Waukesha County Technical College courses through Start College Now were also approved. Both programs were formerly part of the Youth Options Program. 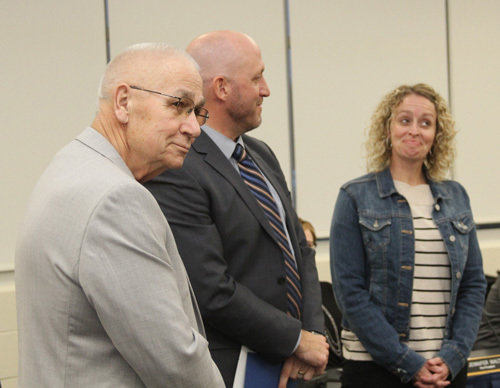 Hamilton Principal Candis Mongan noted in a report to the School Board, as in the past, many students will not be able to take the courses because of scheduling conflicts or full classes. A total of 31 students requested admission to programs last year. ECCP and Start College Now are programs mandated by the state that allow students who have completed tenth grade, are in good academic standing and have no disciplinary problems to attend a technical college or university if the high school does not offer comparable courses. 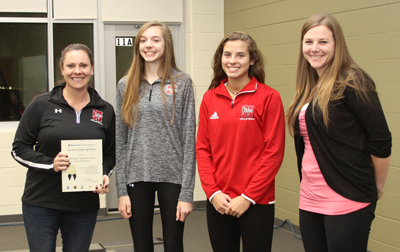 School Board members recognized the accomplishments of two Hamilton High School groups. 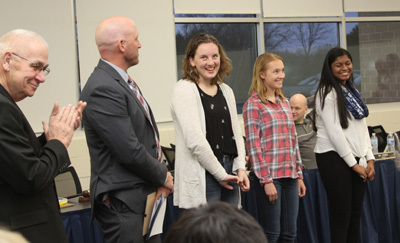 Below, from left: Maja Pechanach, Ellie DeCleene and Nikhita Nair were honored for taking first place at the Wisconsin Education Media & Technology Association Battle of the Books. Members of the team who were not at the meeting were Sean LaVoy and Dorothy Palmer. 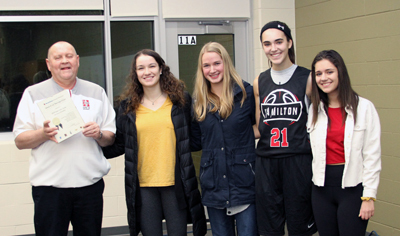 National Merit finalists Abigail Dowse, Ty Kozic, Jonathan Sciortino and Molly Hubred were recognized. accepted the retirement requests of Maple Avenue special education teacher Weigel-Mary Smith, Templeton clerical paraprofessional Cathy Henk and Templeton custodian George Murillo. Nine Maple Avenue Elementary School staff members presented on the effective use of Power Groups to help improve literacy achievement at their school. The literacy intervention groups meet regularly to help Tier 2 and 3 student progress. Principal Kristin Koeper-Hamblin noted that student achievement has increased on the state report card from an Exceeds Expectations rating of 77.4 in 2012-13 to Significantly Exceeds Expectations ratings of 86.9-89.9 in the last three years. She attributed part of the school’s success to the use of the Power Group model. 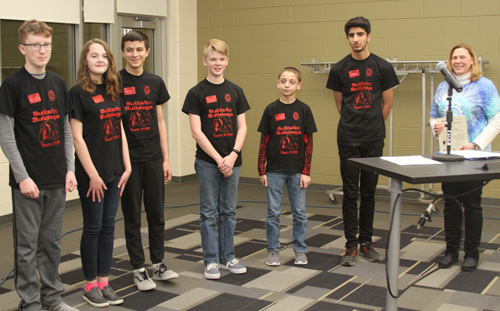 Members of the Templeton Middle School First Lego League (FLL) Robotics teams were honored for their outstanding season. Head advisor Kathy Better introduced members of each team. 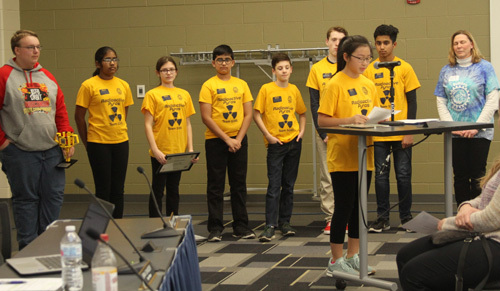 The Radioactive Pyros and Bullistic Bulldogs were among 36 teams statewide that competed Feb. 23 in the Wisconsin FLL Championship. The Radioactive Pyros won the Project Research Award and were nominated for the Project Presentation Award. The statewide award is the first in Templeton history. They won the Project Presentation Award and was nominated for the Gracious Professionalism and Champions Award in sectional competition. At sectionals, Bullistic Bulldogs won the Project Research Award and was nominated for the Project Innovative Solution Award. The district will continue to participate in AdvancEd/North Central Association accreditation at a cost between $750 to $1,000. The accreditation process aligns with district site planning and responds to the public’s demand for greater accountability for schools, including an increased focus on student learning methods and professional development. 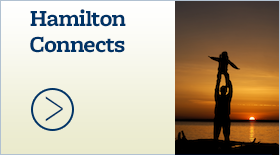 Hamilton has been NCA accredited since 1966. The district plans to continue using CESA services and programs to assist students who are at-risk, not succeeding in a traditional school environment or have specialized educational needs. Alternative placement programs offered through CESA include New Pathways, Turning Point, Project Success, Fresh Start and Distinguished Scholars Academy. Currently, 19 Hamilton students participate in New Pathways, two in Turning Point, one in Project Success, and two in Distinguished Scholars Academy. Services for 2019-20 will be contracted as needs arise. modified the contract for Templeton special education teacher Melissa Brokate El-Meanawy to change her last day to March 12. It has been a little more than a year since Hamilton School District citizens voted in favor of a referendum to build a new intermediate school and renovate and add space at the high school, but in that short time, construction progress has been substantial. At the start of the school in September, several high school applied engineering & technology classrooms and labs were opened. JP Cullen Senior Project Manager Shannon Metoxen provided a progress report on major work that has been recently completed and what is to come. 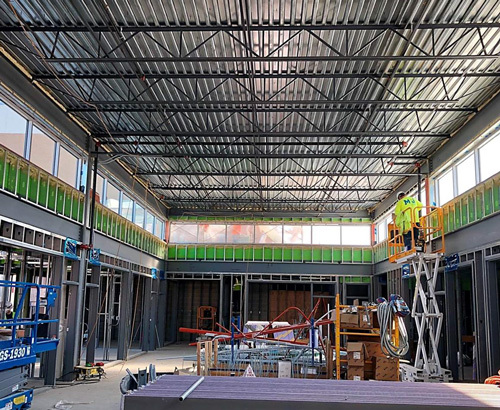 At the high school, the past 30 days focused on the classroom and office addition on the front of the school that included mechanical, electrical, plumbing and fire protection rough work. Stone veneer was completed on all faces of the front addition. The district office area has a roof, windows have been installed and drywalling is underway. High school offices have windows and will soon have a roof. Windows are being installed in the classroom addition. The next 30 days will see completion of the permanent roof, window frames and glass installed, building façade architectural metal panel nearing completion and continuation of drywalling and painting. Ceiling grids will follow painting and cabinet installation is slated to begin March 18. Mechanical, electrical, plumbing and fire protections finishes will continue when the ceiling grid is in place. District staff are expected to move to the new space in May, earlier than initially expected so that the construction crew has more time to return the office space back into classrooms. 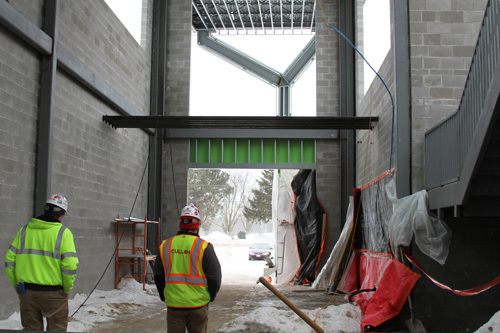 At Silver Spring Intermediate School, masonry crews installed interior walls in the music area. The north side receiving area and office outside walls are being brick veneered. Almost all roof joists have been set. With 80 percent of the roof decking completed, the remaining areas that don’t have roof decking are the library and northeast classroom pod. All stairs have been installed. Roofing is completed on the second floor of the south side classroom pods. First floor exterior windows are installed and 75 percent of second floor windows are in. After second floor windows are complete, the canopy will be the only remaining area. The steel stud structure on the canopy and feature columns are nearing completion and work will continue inside. Office drywall is almost complete. When the remainder of the building is weather-tight, drywalling will continue throughout the rest of the building. Crews have painted most of the office space and the gym is underway. In the next 30 days, interior block work will be completed and brick veneer will continue around the building. Exterior metal panels will be installed and roofers finish up the roof and get the building weather tight. Concrete crews will pour the topping slabs and stairs for the second floor. Terrazzo installation will begin on the first floor corridors and break-out areas. Acoustical ceilings will be installed, followed by casework. When the gym is painted, equipment will go up. The elevator will be installed in mid-March. When the topping slabs and roof is completed, paint crews will paint the break-out spaces. 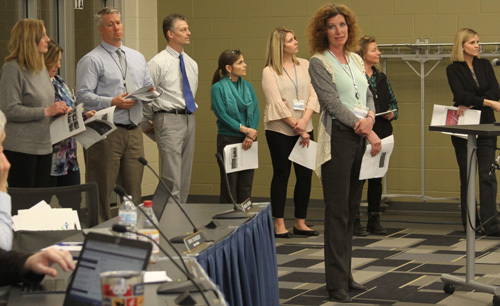 The School Board authorized district staff to once again contract with the Elmbrook School District special education services in the 2019-20 school year. The contract will provide low-incidence disabilities services for students who have autism, intellectual, hearing and vision disabilities and for the placement of one student at Fairview South, a school that serves students with cognitive disabilities. Hamilton is one of 26 school districts that contracts with Elmbrook for services. Districts reimburse Elmbrook based on usage of services. Systems of learning & assessment — All students will be challenged and supported to maximize their learning and achievement. Social & emotional wellness — All students will be supported to develop social and emotional wellness related to academic, career and life experiences. Workforce & organizational wellness –All staff will engage in continuous professional learning and be provided opportunities to improve personal wellness. Facilities & technology — The district will provide adequate classroom learning space while maintaining existing buildings and infrastructure and optimal student access to technology. appointed Marianne Selkey as Hamilton cook, effective Feb. 18, Julie Bigley, district administrative assistant, effective March 18, Murrene Payton, Elizabeth Lodl and Nick Roth, as Summer Opportunities assistant coordinators, effective May 13. 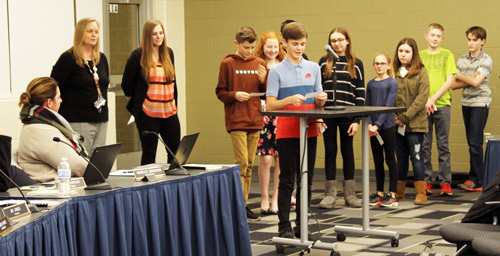 Templeton Middle School grade 7 teachers Mary Caucutt and Ashley Pfeifer and nine of their students described their school’s Literacy Lounge which was started two years ago with a grant from the Hamilton Education Foundation. Their goal was to create a coffee shop or bookstore environment that encouraged students to engage in reading and discuss books. This year they took it to another level by inviting older volunteers from the Seniors & Students Program to participate in book discussions. They showed a video that they submitted as part of entrance in the Follett Challenge. Instructional Services Supervisor Katherine Little, Ph.D., gave three reports in which she recommended resource purchases and updated the School Board on curriculum committee processes and standardized assessments. The School Board adopted nearly $220,000 of math, family and consumer sciences, science and social studies resources as recommended by committees of teachers. Funds will come from Educational Services Department, high school and career prep grants and student fees. The following curricular areas are under review or are being developed: K-12 science; K-12 English language arts; intermediate school applied engineering and technology, and health and wellness; high school courses of math and logic, culture of healthcare and digital design and web development. The Wisconsin Student Assessment System (WSAS) is a comprehensive statewide program that includes the Wisconsin Forward Exam, ACT Aspire, ACT, ACT WorkKeys, Dynamic Learning Maps, ACCESS for ELL and National Assessment of Educational Progress. In addition, the district implements elementary benchmark assessments in reading, mathematics and writing, along with Measures of Academic Progress (MAP) assessments and the Phonological Awareness Literacy Screening (PALS). After looking into the STAR assessment as a potential replacement for MAP, administrators recommended continued use of MAP. Appointed Kalyn Graziano as Hamilton High School administrative assistant, effective Feb. 25; and Laurie Roth as executive assistant to the instructional services supervisor, effective March 1. 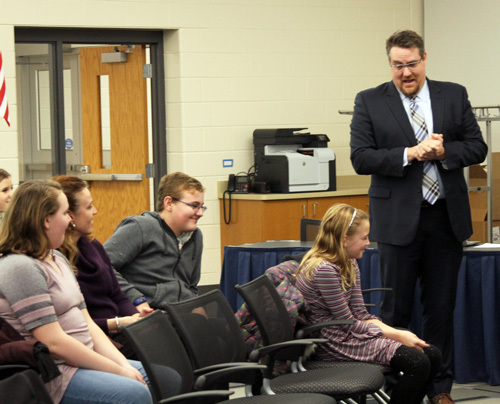 The Hamilton School Board approved the hiring of Mark Peperkorn as the principal of Silver Spring Intermediate School at its Feb. 5 meeting. He will begin his new position July 1. 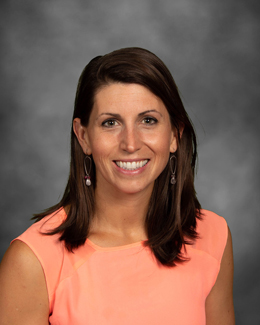 Peperkorn has been principal at Pilgrim Park Middle School in the Elmbrook School District since 2015. He was the Pilgrim Park associate principal before then. He started his career in education in 1997 as a social studies teacher at Waterford Union High School. He earned his master’s degree in educational leadership from Marian University in 2009 and his bachelor’s degree in social studies from the University of Wisconsin – Eau Claire in 1995. 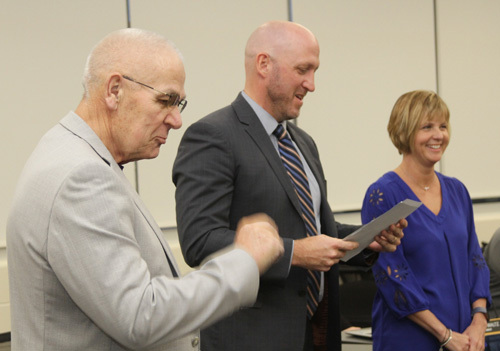 “His strong knowledge of instructional practice, desire to support the best interests of students and ability to forge positive partnerships with families and the community will serve Silver Spring Intermediate School well,” Mielke said. Hamilton School Board members approved the appointment of five employees including the new Silver Spring Intermediate School principal. Marcy Elementary School second grade teacher Whitney Roth, along with four of her students, described their involvement with the Jane Addams Children’s Book Award Program, named in honor of the first American woman who received the Nobel Peace Prize in 1931. The award is given to children’s books that advance the causes of peace and social equality. The Marcy students explained the criteria used for the award. Roth first participated in the program while an education student at the University of Wisconsin – Madison. After becoming a teacher at Marcy, she had students read and discuss nominated books and provide their insights about the books based on criteria of the program. Her reviews of the nominated books now include perspectives of her students. appointed Tamera Ericksen as a part-time Woodside Elementary School special education paraprofessional, effective Feb. 11 and Melissa Brokate El-Meanawy as a Templeton Middle School replacement special education teacher, effective Jan. 24. School Board members Jay Jones and Mike Hyland as well as board president Gabe Kolesari reported on the sessions they attended at the 2019 State School Boards Association Convention. 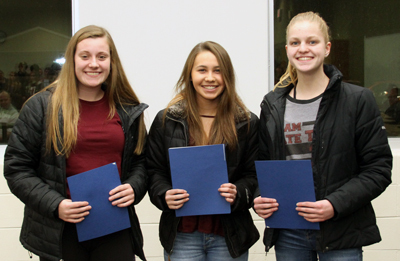 In a report, Hamilton High School Principal Candis Mongan presented the applications of juniors – Kayla Kidman, Vincent Polidori, Zoe Schultz and Payton Wunschel – who requested to graduate early. The students met School Board policy requirements and will be eligible to graduate in January 2020. School Board members approved a new position to assist with Educational Services and Information Technology functions. The position will be in the confidential support staff group slated to start at the end of February. He said the position would support the departments with technical and budgeting activities related to student databases, curricular resources and classroom teacher assessment requirements. Hamilton High School students are getting real-world experience in scientific research, thanks to the work of science teachers such as Alan Simays. 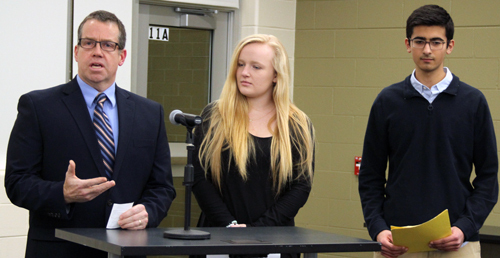 School Board members learned about two such experiences when Simays’ students presented at the meeting. Juniors Mackenzie Joranlien and Kien Rea described the work they have been doing this year outside of the classroom. Joranlien is part of Students Understanding Principles of Research Education through Medicine, Engineering and Science (SUPREMES), an academic yearlong program conducted by the Medical College of Wisconsin, Marquette University and the Children’s Hospital of Wisconsin Research Institute. She furthers her research understanding through state-of-the-art technology, scientific scholarly writing and techniques in laboratory investigations. Rea has been doing research for the Pulsar Search Collaboratory (PSC) involving research in astronomy, namely the measure of magnetization of dead stars. Started by West Virginia University, PSC allows high school students to volunteer and contribute toward scientific discovery. Rea’s goal is to develop an algorithm to detect the difference between pulsar and non-pulsar candidates. As in the past, the district provided transportation or a parent contract for families whose children attend private school. This year, 116 students were transported directly to St. John’s Lutheran School in Lannon and St. Dominic’s Catholic School in Brookfield at a cost of about $60,000 to the district. Families who send their children to other eligible private schools in a 5-8 mile radius of the district are issued parent contracts, and they transport their children themselves. The cost for these parent contracts was $112,736 for 248 full contracts and eight half contracts. 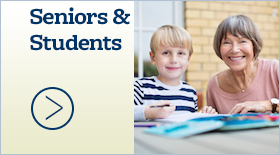 Contracts are issued per student, not per family. The School Board approved the middle school and high school course catalogs. Many revisions reflected course name changes and updated curriculum. At the high school, business education’s “Advanced Applications and Web Page Design” was changed to “Digital Design and Web Development” with a focus on state-of-the-art software. A new math class, “Math and Logic,” is a WCTC transcripted course that delves into mathematical problem-solving techniques to various topics such as symbolic logic, set theory, Boolean algebra and number bases. Another WCTC transcripted-credit course, “Culture of Healthcare,” will be offered for students interested in working in healthcare. It replaced “Introduction to Healthcare Professions.” No longer offered as part of the high school curriculum will be driver education. Templeton Middle School’s course catalog was revised to remove grade 5 registration information and courses. In academic support classes, “Star Math” is now “Flex Math.” In grade 7, “Health” was removed and “Exploring World Cultures” was added. School administrators calculated that the district will not have enough classroom space to take additional Open Enrollment students for the 2019-20 school year due to projected resident enrollment. Open Enrollment is a statewide program that allows students to attend public schools outside of their districts if space is available. School Board members approved a position description for an intermediate school principal which will have a 260-day contract. While a new position was created, the district will not have more administrative positions because two part-time elementary associate principal positions will be cut in the 2019-20 school year. With students in grade 5 moving to the intermediate school, all elementary school enrollments will drop below 600, the point when an associate principal is considered. Silver Spring Intermediate School will have an associate principal because its enrollment will be more than 600 students. 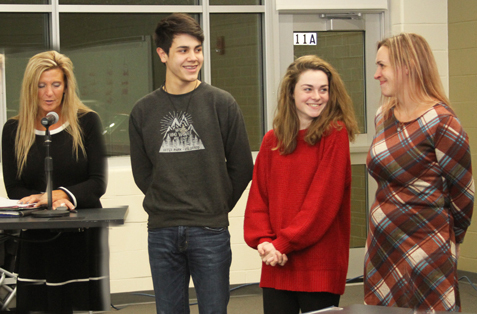 (From left) Hamilton Principal Candis Mongan introduced students Joe Davila and Maggie Flynn and Drama Director Sarah Plamann. 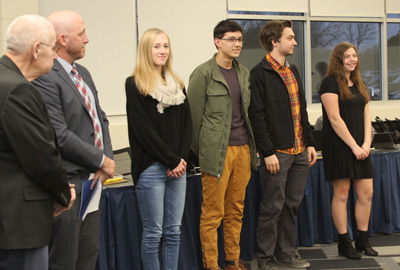 Hamilton High School sophomores Joe Davila and Maggie Flynn were recognized for advancing to national competition after qualifying at the Wisconsin High School Theatre Festival. They were introduced by elementary school music teacher Sarah Plamann who is also the high school theatre director. Davila and Flynn are the first Hamilton students to qualify for national competition in the One-Act Contest. They will compete in June at the University of Nebraska – Lincoln. In a written report, Lannon Principal and Summer Opportunities Coordinator Brian Balfany informed the School Board on plans for the upcoming summer school session which will operate June 19 to July 17 with days off on July 4 and 5. 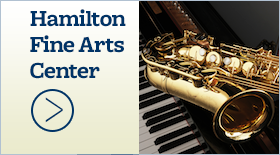 The program will be offered at two sites – Hamilton High School and Maple Avenue Elementary School. New for parents who enroll their children in Summer Opportunities will be the option to use Y-Care services after summer school classes are done for the day, according to Superintendent Paul Mielke, Ph.D. YMCA childcare, provided independently of the Summer Opportunities program, will be at Woodside Elementary School on days when summer school is in session. Only students enrolled in Summer Opportunities, who will be bussed to Woodside as part of the shuttle bus service, will be able to participate. Families will contract with YMCA directly to participate. Mielke said additional opportunities for popular STEM classes will be available this year, and an ACT prep course is being investigated for high school students. Fees that cover the consumable materials used in class will remain at the same $4-$20 level they have been in the past. The bus service that shuttles students to and from elementary schools and the high school will remain at a cost of $20 per rider. 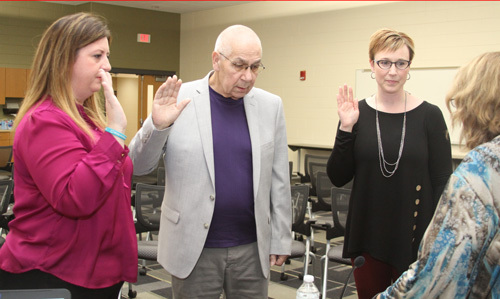 In his report to the School Board, Superintendent Paul Mielke, Ph.D., reported that three incumbents whose positions are up for re-election this spring and one challenger have filed papers to run for School Board. Rebecca Zingsheim, who was appointed to fill the Village of Butler seat last year, will run to complete the final two years of the term. Gabe Kolesari, whose position is designated from the Village of Sussex, and Jennifer Waltz, who serves an at-large position, filed papers to run again. Waltz will be challenged by Lori Schnitzka for the at-large seat. A primary election will not be necessary. The general election will be April 2, and successful candidates will take office April 22.
appointed Gail Greve as a Maple Avenue literacy interventionist replacement effective Jan. 2, Justine Klug as Templeton associate kitchen employee effective Jan. 7, Elisabeth Leach as Marcy special services paraprofessional effective. Jan. 22 and Amy Jung Templeton special services paraprofessional effective Jan. 22. Hamilton School Board members approved the 2019-20 school year calendar with two significant changes. Elementary and intermediate schools will have two days before the start of classes to conduct Great Start conferences and student assessments. Known as Jump Start conferences at Willow Springs Learning Center, the additional time that would traditionally be the first two days of school will be set aside for teachers to meet with parents and gather information about students’ academic levels before the start of classes. It is expected to help staff gain a better understanding of their students sooner in the school year. Another change is a day off in October for students and staff to achieve a more balanced schedule between semesters. June 11 – last day of school for students. 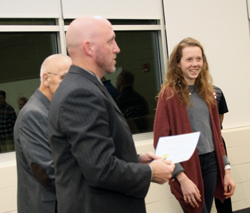 Hamilton High School athletes and teams that were conference champs or sectional or state qualifiers were recognized at the School Board meeting. Athletic-Activities Director Mike Gosz introduced coaches and their teams. accepted the resignations of Hamilton High School administrative assistant Samantha Nehls, effective Dec. 12, Marcy special services paraprofessional Candy Bauer-Goetz, effective Dec. 21, and Marcy grade 2 teacher Brigid Ingram, effective Dec. 17.
appointed Kim Pierce as Marcy associate kitchen employee, Julie Rossi as Templeton part-time custodian, and Jane Schmid as Hamilton cook, all effective Dec. 17. General school allocation will be $108 per student for elementary, $128 for intermediate, $138 for middle and $168 for high school. The library allocation will be $33 per student at all levels. Capital outlay per-pupil allocations will be $18 per elementary and intermediate student, $20 per middle school student and $25 per high school student. The Hamilton School Board ratified a one-year contract with United Lakewood Educators (ULE) which represents district teachers. Under the contract, base salaries will increase by 2.13 percent for 2018-19, retroactive to the beginning of the school year. In addition, the regular supplemental compensation for Hamilton teachers will increase by $400 per teacher, prorated based on percentage of full-time employment, plus position adjustments for identified staff. The tentative agreement was reached Nov. 28 between the district and ULE representatives and was presented to ULE members last week for a ratification vote. The increases do not apply to teachers on replacement contracts or plans of assistance. 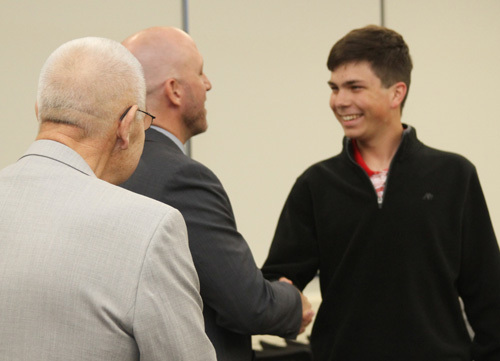 Information Technology Manager Ben Hawley updated the School Board on hardware and software updates, networking initiatives, assessments and testing, student information system news, operation of the Help Desk ticketing system and security grant initiatives. New this year is a student-run help desk system created at the high school to assist Informational Technology Department staff with overall workload and 1:1 support. Four students are located in the library and closely working with IT on day-to-day work and escalations. IT staff created a Google Classroom for the student helpers along with a separate Help Desk website to track tickets and assets. Future projects include completion of the district’s one-to-one Chromebook initiative in grades 5-12, setting up the new intermediate school with internet-fiber and equipment, provide network and security training for staff, streamlining printers and copiers, replacing smartboard and projectors. 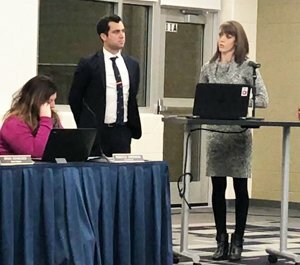 Hawley noted in his report that with the addition of a new school, additional rooms at the high school, one-to-one Chromebook initiative at Templeton Middle School and Silver Spring Intermediate School, IT is projecting a total of 9,000 devices in the district, which is a 30 percent increase. Hawley warned that IT staff is stretched thin. 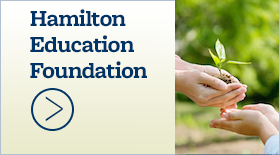 The number of Hamilton School District students who are English Language (EL) learners increased by seven students from last year for a total of 74 students in the program that provides interventions for students with language difficulties. The number of EL students has ranged from 61 to 79 in the past five years, and before then it was as high as 106 students. A total of 26 different languages are spoken including Russian, Mandarin and Punjabi with the two most prevalent languages being Hmong and Spanish. Jelena Kapetanovic and Katie Kasper, whose full-time equivalency is 1.5 positions, serve EL students throughout the district. This year Kapetanovic and Kasper collaborated with other teachers in the region to identify resources and instructional strategies for classroom teachers to assist their EL students. Work on that project influenced the state to create an EL Policy Handbook. Later, Kapetanovic and Kasper used their experience working on the project to create a district resource guidebook for Hamilton teachers. Lannon Elementary School Principal Brian Balfany and second grade teacher Sarah Cromos presented on how student-led conferences are making an impact in the classroom. Rather than the traditional parent-teacher conferences, where the teacher does most of the talking, student-led conferences has students leading the discussion, informing their parents about how they’re doing, what their goals are going forward and what kind of learners they are. The district has negotiated an agreement with Verizon to install a cell tower on the southwest light pole on the high school soccer field. The tower would mirror the U.S. Cellular tower already installed on the northwest tower of the field. The agreement states that the district would receive a $20,000 signing bonus and $15,000 a year for five years. Installation will begin in the spring or summer of 2019.
approved the appointment of Samantha Nehls as Hamilton High School administrative assistant, effective Dec. 10. Nov. 5 in-service focused on understanding the “why” behind using the Backward Design unit planning process. Content and grade level teams met to begin redesigning one instructional unit, ensuring that standards and assessment are the focus. Assessment Team members facilitated the learning. Assessment Team is in the process of providing feedback to teams on the work completed at the in-service. English-language arts curriculum team is in the process of unpacking and prioritizing the state standards. K-8 science curriculum team has completed drafts of the practice rubrics and is in the process of pilot testing them. 9-12 science curriculum team is reviewing the practice standards in preparation for rubric creation. Anna Silberg, Ph.D., conducted mindfulness workshops for teachers. The Social Emotional Wellness (SEW) Committee met Oct. 23 with Response to Intervention (RTI) consultant Yuliana Manriquez to discuss the next steps of planning for Positive Behavioral Interventions and Supports (PBIS), a systematic approach of teaching and reinforcing behavioral expectations through the lens of RTI. Each school had its PBIS leadership team in attendance. The PBIS leadership teams met Nov. 14 with Manriquez and received training on the PBIS system. These teams will come back together for day two of this training Feb. 14. Marcy and Woodside elementary schools’ classroom teachers completed the Devereux Student Strengths Assessment (DESSA) on all of their students between Oct. 15 and Nov. 15. School teams are reviewing the data and are in the process of aligning supports with students who were identified with social emotional needs. Workforce & organizational wellness – All staff will engage in continuous professional learning and be provided opportunities to improve personal wellness. A total of 25 staff members are participating in the “Maintain Don’t Gain” weight loss challenge through Aurora Health Care. They are receiving weekly health tips and healthy recipes to support them through the holidays. Another 30 staff members are participating in yoga classes. Flu shots were offered to all employees in October and 217 participated. Some 127 teachers and administrators are participating in the alternative evaluation process. The district sent out Top Workplaces surveys to gather staff engagement data. Human resources sent an interest survey to support staff regarding employment opportunities at Silver Spring Intermediate School. Business services conducted HRA support seminars. Educational services conducted after-school staff input sessions as part of the school calendar development process. A “gourmet greens” salad bar emphasizes power foods and antioxidants has been offered to high school students and staff. Facilities & technology — The district will enhance student learning by providing adequate classroom learning space while maintaining existing buildings and infrastructure and optimal student access to technology. Masonry walls and steel nearing completion with temporary weather tight condition scheduled for December at the high school addition and Silver Spring Intermediate School. Raptor visitor management system installed at each school’s main office for visitor management. Current camera security system expanded from 75 cameras and one server at the high school to 250 cameras and three NVR servers across the entire district. Voice over IP (VOIP) servers and phones are being prepared for Marcy and Woodside implementation second semester. Axis door control cameras and visitor buzz in implemented for all schools, including the Y-Care entrances at the elementary schools.